Oops . . . I did it again . . . I bought ANOTHER cookbook. This one is a real winner! It started when I came home with a new set of stainless steel measuring spoons. Everyone needs a set of stainless steel measuring spoons. My mom gave me her Kohl's cash, because she wasn't going to make it over there before it expired. So, I didn't actually have to pay anything for these spoons. The problem is, that I kind of have a little obsession with measuring cups and spoons. So, "The Mr." opened my drawer and said okay then, you need to get rid of one of these sets you already have, because you don't have anymore room. Then he said, anytime you come home with something new, you have to get rid of something you already have. In my mind, I heard It's okay honey, go ahead and go shopping all you want, but you might want to give away something in return. So, I got rid of a cookbook I have never used and I went and bought a new one! I found a new blog back when I was searching for a Copycat Cafe Rio Tortilla Soup recipe and I have been a fan ever since. When I saw they were coming out with a cookbook, I had to pick up a copy. One of the sisters lives in Utah and I have to support my fellow Utahns. I am loving this new book, lots of yummy things I want to try. I love that the majority of the recipes are from scratch, yet still really easy to make. I found these pork chops in that new book and adapted them to my taste. They turned out WAY GOOD. The flavor was incredible and I know I will make this recipe a lot. Place pork chops in a large plastic zip-top bag. Combine all marinade ingredients and pour over the pork. Squeeze bag to release excess air before sealing. Marinate the pork in the fridge at least two hours (the longer the better), flipping the bag over partway through. Grill pork over medium heat until internal temperature registers 160 degrees on an instant-read thermometer. 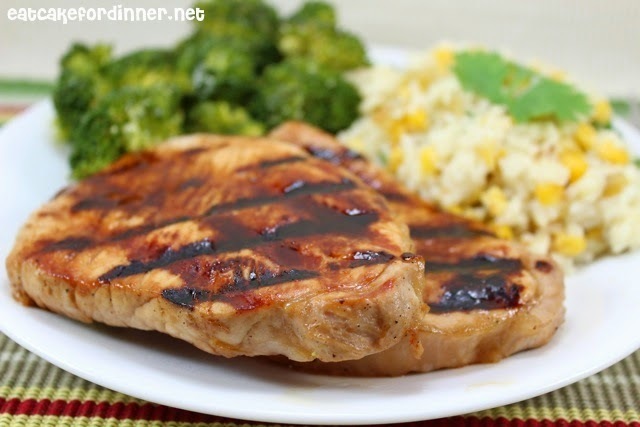 Jenn's Notes: I marinated my pork chops for around four hours and they tasted amazing. I grilled them on the George Foreman. If you would like, you could set aside a small amount of the marinade before adding the pork and drizzle it over the pork chops before serving. The pork chop recipe looks great and I am looking forward to seeing new recipes from your new cookbook! That sounds like me... buying another cookbook. Love a good pork chop recipe since I like to stock up while its on sale. Do you think these chops could be made in the frying pan instead of on the grll? So funny Jenn, my husband said the same thing when I bought my Ninja 3-in-1 cooking system. I already had quite the collection of crock pots going. I donated two of my older ones (which still worked just fine) to a church that takes meals to a local Hospice where my Dad spent his last days. It was greatly appreciated and I know good meals will go to families that need it during a very difficult time. The pork chops sound delicious! Pinning it! It feels so good to donate something to a place that could really use it. Thanks for all the pins!